"For me, it's no question. I think this energy comes from above. Not from the ground. It comes from above." 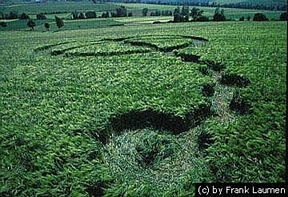 May 17, 2000 this formation was discovered in a field of barley at Doernberg close to Zierenberg and Kassel, Germany. This was the third of nine formations in May. Photograph © 2000 by Frank Laumen. May 30, 2000 Kassel, Germany - Since May 1, 2000, nine mysterious crop formations have been discovered in Germany, the greatest number in one month since the phenomenon began to seriously show up in the world in 1990. Previous PostPrevious New Crop Formation in Famous East Field, Wiltshire, U.K.